We depart from Mytilene at 10:00 in the morning. 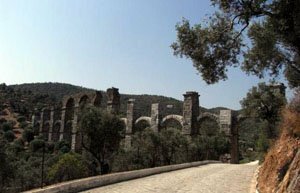 The first destination is the Roman aqueduct in Moria which dates back to the second century, having a length of 170 metres and a height of 25 metres. After the roman aqueduct we will visit the Archaeological Museum of Mytilene, where statues, pottery and jeweleries are exhibited and date back to the pre- historic times until the Roman age. Then, we will walk inside the town of Mytilene, where we can see the Statue of Liberty. We will also visit the Byzantine castle, the ancient theatre and the church of Saint Therapontas in the central market called Ermou. Our next stop is the Theofilos' museum, in Varia of Mytilene. In the museum are exposed paintings of the folk painter Theofilos Hatzimihail. The museum is accommodated with the “Teriant” modern art museum, where are exposed works of art of popular artists, both strangers and greek ones, as well as copies of hand-writings from the medieval age, like those of Sagal, Matis, Picasso, Leze, Tsarouhis and of many others. Later, we arrive at the beach of Saint Ermogenis where the water of the sea is crystal and green because of the pine trees. We will make a stop for lunch at the small port of Kountouroudia. 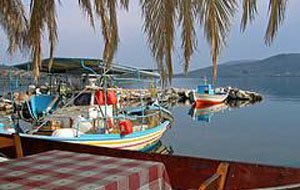 After lunch, there is the capacity to go around the place by boat which can transport you across the gulf of Gera and more specifically to the village of Perama of Gera. Return to Mytilene at 20:00. The excursion does not include: Food, drinks, tickets for the museums and the archaeological sites, boat tickets.